Kon’nichiwa you absolute stun buns. 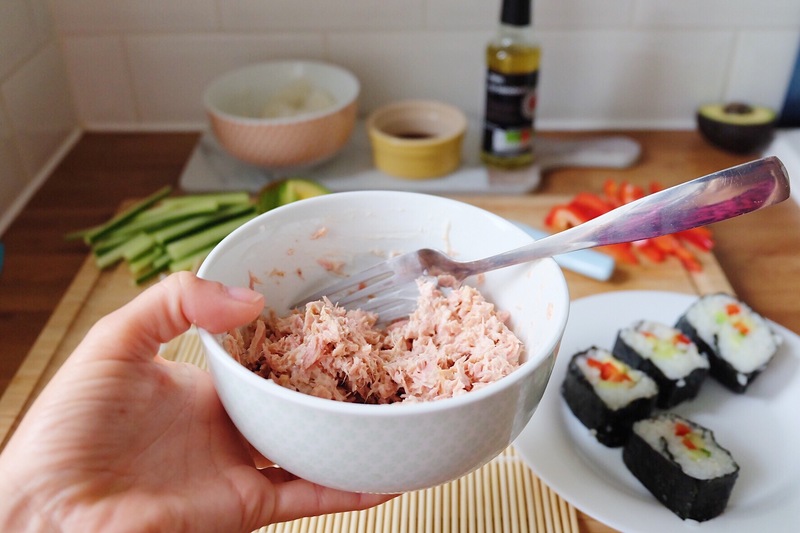 Today I’m talking to you about sushi; my fave snack when I’m out and about and totally forgotten to food prep. My fave branded sushi, apart from the specialists like YO Sushi & Wasabi, is from Boots. Beats M&S hands down. But I’ve often wondered how easy it would be to recreate this snack at home. Cue me going out and buying all the sushi making materials and giving it a proper good go. And guess what? It really wasn’t that tricky or time consuming. I mean, it’s not a food-in-a-rush kinda snack. But it’s certainly up there with the time constraints of a toasted sarnie. 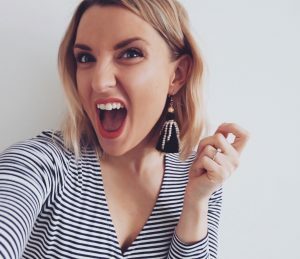 It was also a really great opportunity for me to use my new photo prop *sassy lady emoji* – yeah I’m now a lady who’s always on the lookout for things that look snazzy in flatlays. The marble look platter the the first image was just one of the many lovely things that Tesco’s have in their new homeware range. And the best bit? It was only £5. Jawdropping, I know. So back to the whole sushi thing. 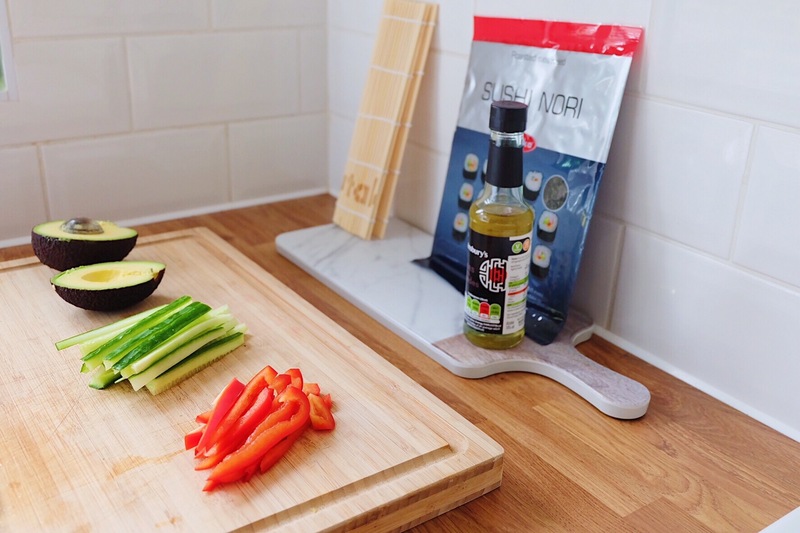 First things first; you don’t need a ton of hard-to-source ingredients to make sushi. Don’t be fooled, it really is just rice wrapped around stuff. That is it. 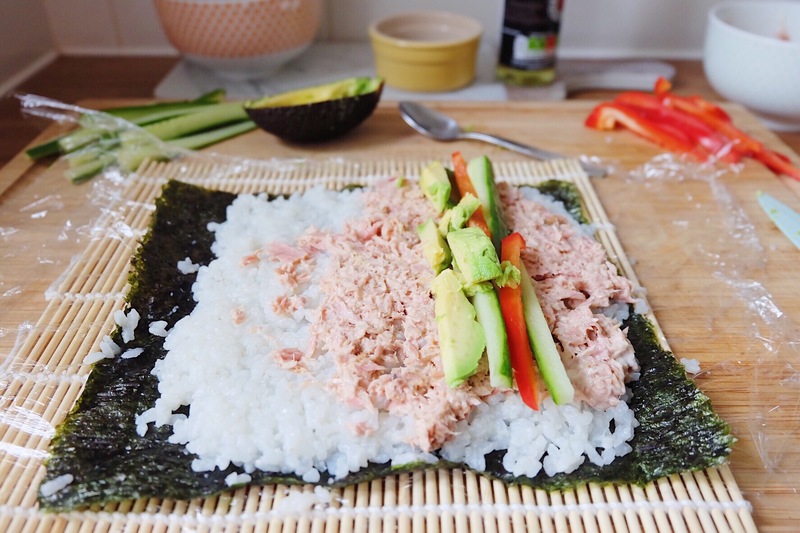 Before I go any further, hands up who else thinks nori sheets are the yummiest things in the world? I had really good intentions to make sushi a few weeks back but I ended up eating the nori sheets as snacks straight out the box instead. Yup, guilty. So back to the whole recipe thing. I honestly think the only way you can screw up sushi is by ONE, overcooking the rice. And TWO, overfilling the roll. I was guilty of doing both these things on my first go, so here’s me advising you not to make the same mistakes. You are welcome, pal. Cook the rice (as per instructions, ie DON’T get distracted by cat videos on FB and overcook it). Let it cool on the side and start prepping your veggies. Cut the raw veg up into thin sticks and set aside. 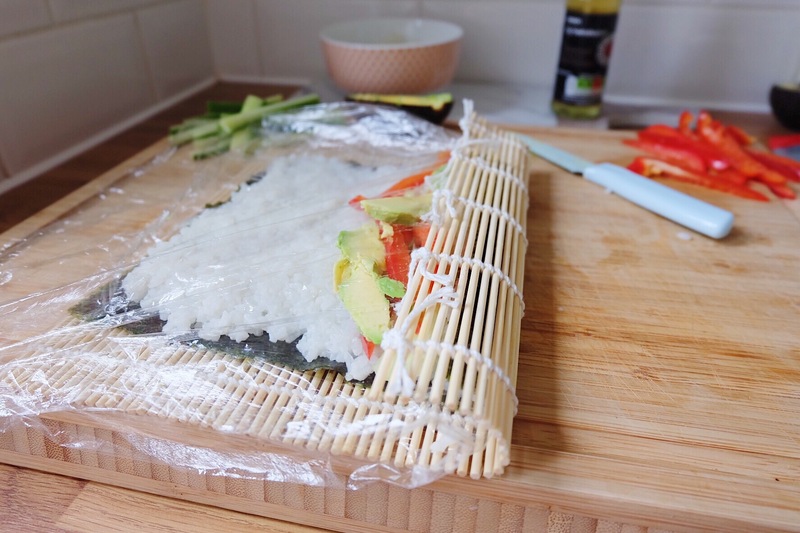 When the rice is cool, lay out your sushi matt, then a layer of cling film and then a nori sheet on top. 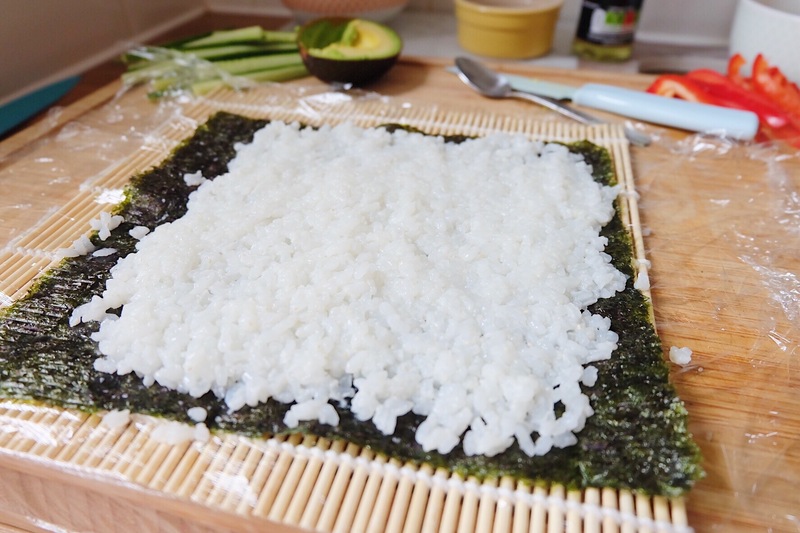 Dip your hands in cold water and spread your rice into a thin layer over the nori sheet. 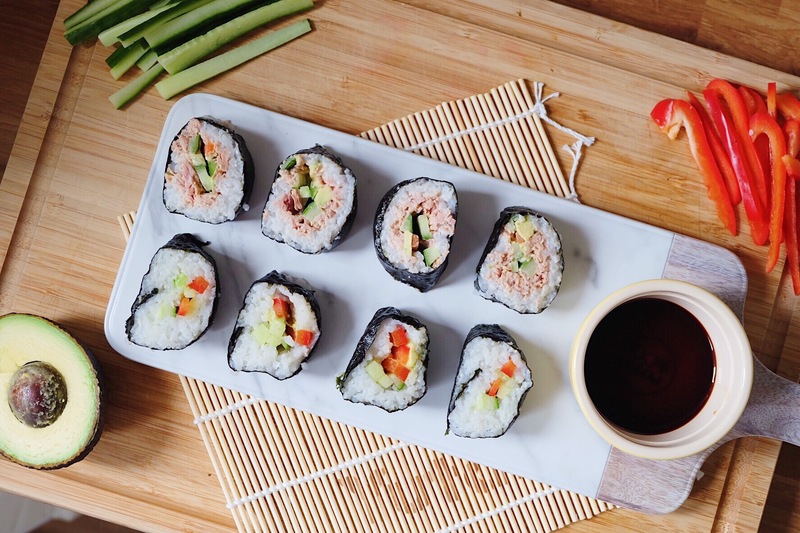 Now don’t be thinking ‘oh I’m a super hungry sushi monster I want all the carbs, add more rice la la la‘ because it makes it really hard to roll and you end up with loads of rice squelching out the end (believe me, I know). 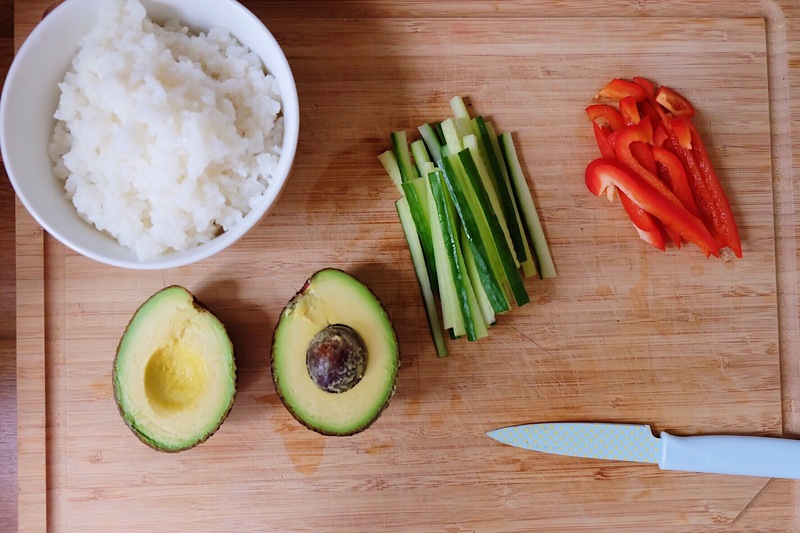 Once you have a good layer of rice, make a vertical line of filling or veggies. Nice and compact. Now here come’s the ‘they see me rollin’ bit. 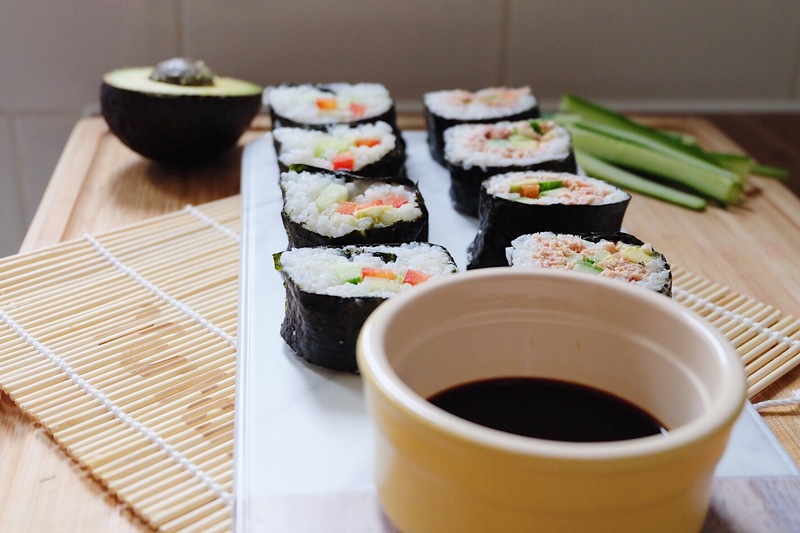 Very carefully, lift the tea towel and begin to roll the sushi over. Run your hands down the length of the sushi roll (that didn’t mean to sound so x-rated, cheeky cheeky) . This is to check that it’s all compact and in the right shape. And then basically, keep rolling over until you have a nice neat long bit of sushi. It’s a bit fingers and thumbs and a little bit tricky but you’re basically going for what looks like a chocolate log shape. Lols. Seal it by dabbing a bit of water along the edge of the nori sheet. Peel away the clingfilm. And then using a long, sharp knife, cut she sushi into mini rolls. TOP TIP; slowly cut through the sushi in long cuts. Don’t try and hack through it like a maniac because it squishes all the filling out. TA DAH. You made sushi. Go and eat it all up. I advise a side of soy sauce for dipping.  If you want it explained a bit more carefully, here’s some other resources here and here. I had to look up pictures of the sushi assembling so I would advise doing that too. And FYI, this was my first time making sushi. So I am by no means an expert (ie do not judge the roll mate, I know it’s a bit overfilled and the rice is waaaaay overcooked). But guess what? It tasted flippin’ ace. I even gave it to Max in his packed lunch for work and he (apparently) dead enjoyed it. Yes I make him a packed lunch. The ‘perfect wife’ life chose me.